Install it from the Chrome Web Store (it's free and will always be free). 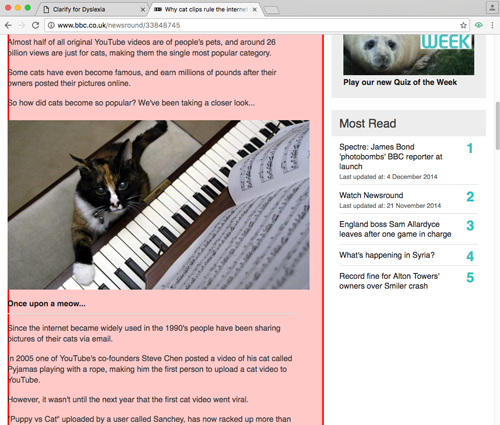 Put simply, Clarify is an extension for Google Chrome that is designed to improve website readability for dyslexics. 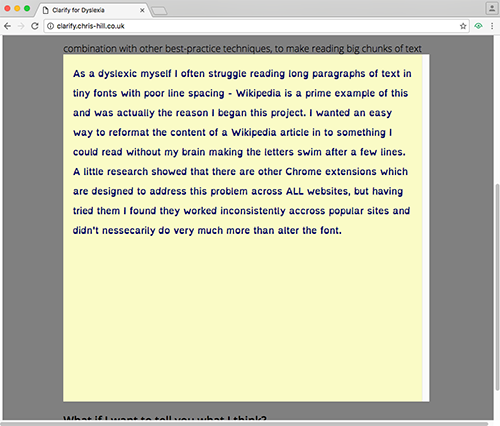 It makes use of the Eulexia font and a low visual stress colour scheme, in combination with other best-practice techniques, to make reading big chunks of text a much more comfortable experience for people with Dyslexia. Once installed, activate Clarify by clicking it's icon in the Chrome menu. The icon will turn green when Clarify is switched on. Moving your mouse around the website will now highlight the elements on the page. Once you have the text you want to read highlighted, click the mouse. A pop up will appear on the screen with the text reformatted by Clarify. Clicking outside of the pop up, or deactivating Clarify by clicking the Chrome menu icon, will close the pop up and return you to the website. 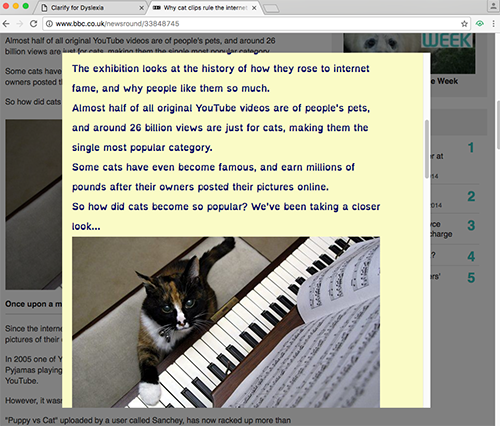 You can highlight larger areas on the page to include more than a paragraph at a time, and all images and links will be copied in to the pop up. As a dyslexic I often struggle reading long paragraphs of text in tiny fonts with poor line spacing - Wikipedia is a prime example of this and was actually the reason I began this project. I wanted an easy way to reformat the content of a Wikipedia article in to something I could read without my brain making the letters swim after a few lines. 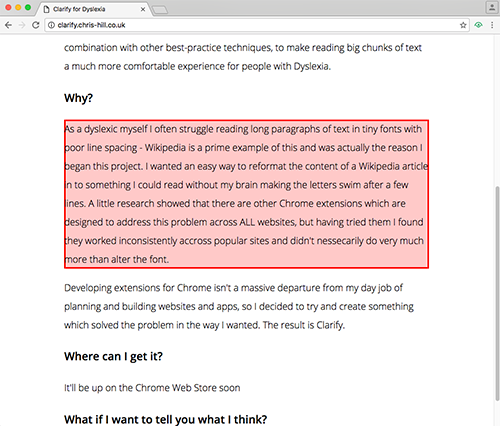 A little research showed that there are other Chrome extensions that are designed to address this problem, but when I tried them I found they worked inconsistently and didn't necessarily do very much more than alter the font face. Developing extensions for Chrome isn't a massive departure from my day job of planning and building websites and apps, so I decided to try and create something that solved the problem in the way I wanted. The result is Clarify. What if I want to give you feedback? Get in touch with me on Twitter, I'm @Hill79.